COS board members Chris Michalek, Dan Lory and Jill Niland had a nice time at the Metropolitan Brewery event on Sunday, August 19. While hardly an excuse is needed to go birding at this river front attraction, the impetus was an invitation for COS to participate in the evening portion of the Avondale Garden Walk and Agriculture Fair. During a birding demo on the brewery's patio, Chris, Dan and Jill had a chance to talk about birds and birding with some great people. While making use of COS provided binoculars, participants were able to pick up 22 bird species. Not bad for an evening in mid-August in the heart of old industrial Chicago. Highlights included a nicely posing Kingfisher, Great Blue Heron and Baltimore Oriole. 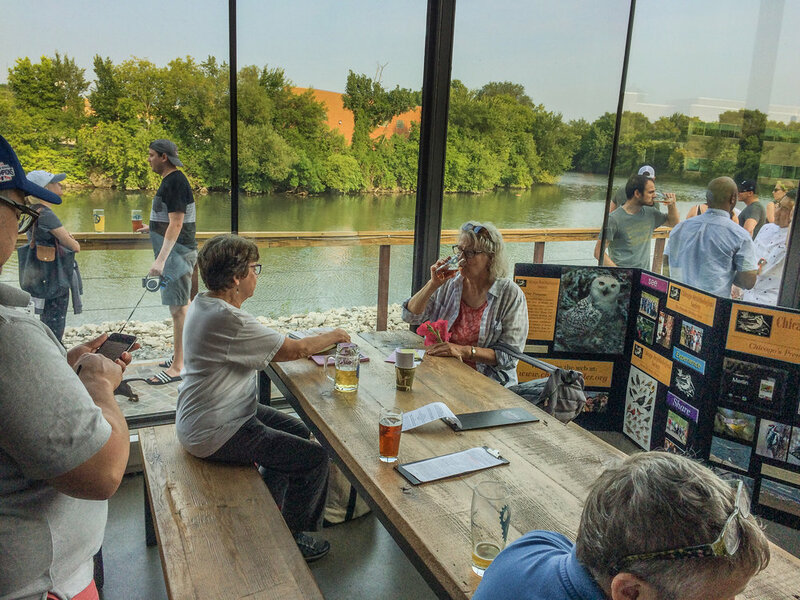 The brewery’s patio is already a great place to bird and between rumored plans to expand it and the river's ever improving health, it will only get better. Getting up close with wildlife and the importance of the river was a theme reinforced that evening with our partners at Friends of the Chicago River in attendance and by the event organizers themselves who are active kayakers. Also, there were also goats in attendance.